The French Morbier clock is known as a privincial clock, to distinguish it from clocks made in major urban centres, primarily Paris. The clock was named after the village of Morbier, located about 30 miles North to North-West of Geneva on a trade route, la route nationale 5, between Paris and Geneva. Morbier was a rural, agricultural (dairy) community in the Jura Mountains of the Franche-Comté region, near the French border with Switzerland, famous for their Morbier cheese. Starting in the second half of the 18th Century, farmers began to manufacture clock parts during the cold winter months. These clock parts were purchased by finishers, who would assemble the parts to create a clock. The clocks were then ostensibly sold to travellers passing through town. Morbier clocks are also known as Comtoise clocks because of the Franche-Comté region where they were produced. Production stopped around 1914 because of the Great War. Tourism is a significant part of the local economy nowadays, supplementing income from agriculture, as the production of clocks once did. 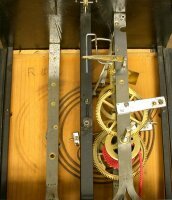 Below are photos of a Morbier clock as it was disassembled, revealing the high quality of its relatively massive parts, mostly made and finished by hand. 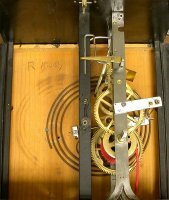 The photo in Figure 2 shows the clock after the pendulum leader, the hour wheel and the minute wheel have been removed. The clock is serviced in two stages. Here the time train is shown during disassembly. 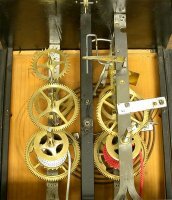 This particular clock is a later example of a Morbier, from about 1900, showing a recoil anchor escapement. 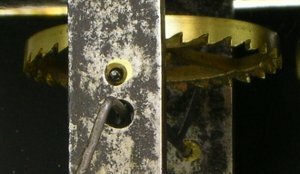 Earlier Morbier clocks have the crown escape wheel, essentially the Verge and Foliot escapement adapted for use with a pendulum. All escapements with crown wheels wear more quickly because of considerably higher levels of friction in the actions of the pallets. While the earlier Morbiers are certainly more desirable among collectors, later examples are preferable because of better technology and greater durability. The back plate is also removed for cleaning and repair. After servicing the time train, the strike train is disassembled for servicing similarly. Morbier clocks are the only clocks I have seen with the vertical rack. Another unusual feature that Morbiers have is that they strike twice on the hour: for example, at 6:00, the clock strikes six times, and at 6:02, the clock strikes six times again. My understanding is that the first strike was a call to prayer and the second strike was to indicate when to begin prayer. The clock also strikes once on the half hour. The religious tradition seen here dates back to the 12th Century, when most clocks were built for churches. People listened to the church bells to know what time it was, when to pray, and when to eat. 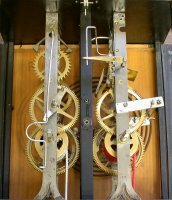 The plates holding the gears together in Morbier clocks are somewhat similar in design and construction to the medieval church tower clocks, made of strips of forged iron, as if the Morbier clocks were small versions of the great tower clocks. The next two photos show side views of the time and strike gear trains. The use of decorative weights (force of gravity) in the strike levers instead of springs is an elegant design which works very well. 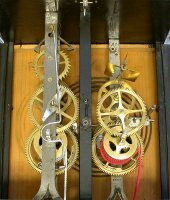 The earlier Morbier clocks are of more interest to collectors because they have the crown wheel and verge escapement. You could think of the anchor escapement above as a two-dimensional version of the verge escapement. Both are recoil escapements, but the verge has a lot more recoil action because it has a much smaller radius from the pallet tip to the axis of rotation. 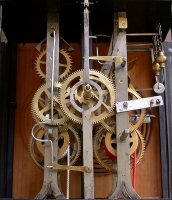 The verge escapement was originally an adaptation of the old mechanical alarm, dating back as early as 1100 A.D. (Anno Domini MC). If you take an alarm and add a second hammer to the verge, you could adjust the radius of the hammers to use the setup for timekeeping. You then have what is called a foliot, which was essentially the ancestor of the balance wheel in clocks and watches. 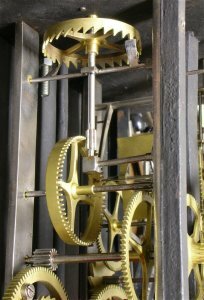 You can read more about this in The Origin and Evolution of the Anchor Clock Escapement. The verge and foliot was used widely between 1285 and 1657, more or less. Technology was slow to change back then. The anchor escapement was developed around 1657 as an adaptation of the verge for use with a pendulum. The anchor escapement was easier to manufacture, had less friction, allowed for a reduced angle of swing of the pendulum, was more foregiving in its adjustment requirements, and easier to repair. In short, it was a better technology: everything about the anchor escapement was better. Below is another crown wheel in a Morbier, this one in poor condition. Surprisingly, however, this clock does run. When you encounter a clock with this kind of damage, the clock may run, but its adjustments become less forgiving. 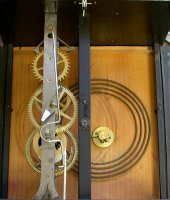 As a collector, I am fascinated by the crown wheel and verge escapement, especially because they have so much history behind them. Nevertheless, if I had a Morbier with this escapement, I would not use it on a daily basis, using it only on special occasions. For daily use, I would look for a Morbier with an anchor escapement.